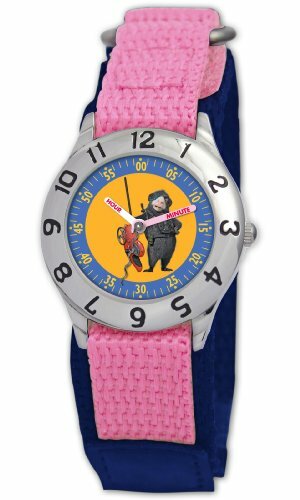 Get armed for timekeeping with the Disney Kids’ G-Force Time Teacher Pink Velcro Watch. This adventurous watch features an image of fast-paced weapons expert Agent Blaster from Disney’s G-Force. Although the G-Force specializes in espionage, this watch’s eye-catching yellow- and blue-tone dial makes it hard to go undercover. 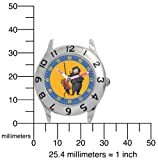 And your child will have no trouble telling the time with this watch, thanks to the large, easy-to-read numerals. Clear yellow-tone Arabic second indexes can be found on the outer dial in increments of five, while black Arabic hourly indexes are boldly etched into the silver-tone bezel. 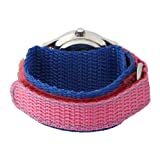 For long-lasting use, both the bezel and case are durable metal and connect to a cheerful pink and blue nylon Velcro band that fastens with ease. 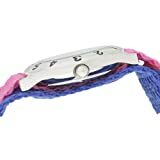 Plus, this lively, kid-friendly timepiece is built to survive playtime with reliable quartz movement, fine mineral dial-protection, and water resistance to 99 feet (30 M). 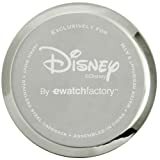 This fun-to-wear watch comes with an exclusive stainless steel Disney case for superior presentation and long-term protection.